If you are looking for a career in financial tech, you may be trying to decide between accepting a position with a well-established company in the financial technology space or one of the many relative newcomers to the field. Paysa collects data from thousands of tech businesses and distills that data into actionable insights for job seekers. Today, Paysa compares two leaders in the fintech space, namely Visa, the ever-present, dominant financial force with a strong foothold globally, and Square, the fintech relative newcomer that burst onto the mobile payment scene in 2009 and shows no sign of slowing down any time soon. Though Visa’s appeal rests largely in the sheer size and stability of the company, Square offers tech talent an exciting opportunity to be on the forefront of financial technology today. Thus, Square is poaching some major tech talent from several sectors, which in turn bumps up its Paysa CompanyRank considerably. Square is currently ranked at number 7 for tech talent globally, while Visa is further down the list at number 54. As you can see from the chart below, the trajectory of the two companies intersected in November of 2013, but since that time, Square’s CompanyRank has driven its way to steady increases with Visa firmly in its rearview mirror. It is important to note, though, that Visa disclosed in regulatory filings in 2016 that it actually owns 10 percent of Square’s stock, making the two not entirely adversarial competitors in the financial industry. Paysa CompanyRank comparison over the last three years. 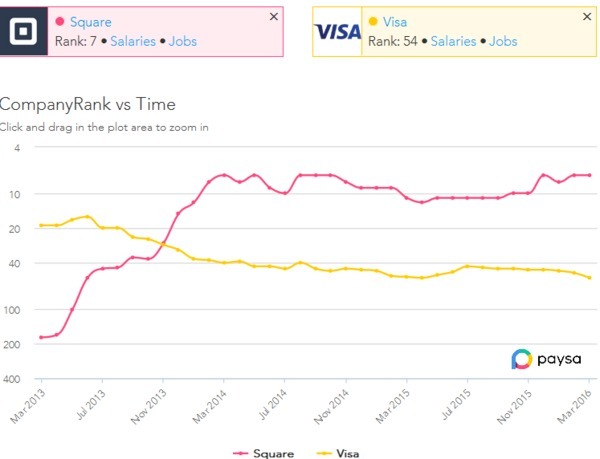 Square also outstrips Visa soundly when you compare overall salaries between the two companies. This may be due, in part, to the sheer volume of workers across Visa’s vast financial eco-system. Another factor may be the buzz Square has received since its inception. Landing on Inc.’s 2013 25 Most Audacious Companies list, Square is drawing top talent with its emphasis on forward momentum in the fintech space. Paysa Salary Rank for Square and Visa. Based on 960 profiles, the average base salary for Square employees is $139K per year, ranging from $111K to $169K. The average market salary is $218K per year, which includes $139K Base Salary, $23.3K Signing Bonus and $64K Annual Equity. Top job titles at Square include: software engineer, senior software engineer, engineering manager, data scientist, and production engineer. Top cities for Square employees include: San Francisco, New York, Atlanta, Los Angeles, and San Jose. The education for Square jobs varies according to position, but 71 percent of jobs require a bachelor’s degree, 25 percent require a master’s degree, and 7 percent require a doctorate. Top skills needed include: Java, Python, Ruby, and C++. Based on 4,200 profiles, the average base salary for Visa employees is $111K per year, ranging from $75.6K to $149K. The average market salary is $135K per year, which includes $111K Base Salary, $17.7K Annual Bonus and $12.3K Signing Bonus. Top job titles for Visa employees include: senior software engineer, software engineer, and project manager. Top cities for Visa employees include: San Francisco, Foster City, Austin, Denver, and San Jose. The education for Visa employees breaks down like this: 52 percent need a bachelor’s degree, 24 percent need a master’s degree, and 1 percent needs a doctorate. Top skills needed include: SDLC, Agile Methodologies, Project Management, and Requirements Analysis. 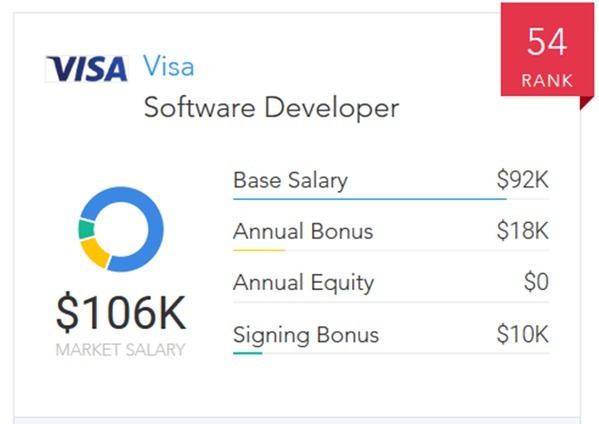 Visa: The average base salary for Visa software developers is $92.1K per year. The average market salary is $106K per year, which includes $92.1K base salary, $18K annual bonus and $10.1K signing bonus. Visa software developers are promoted, on average, at 4.4 years. 58 percent need a bachelor’s degree and 29 percent need a master’s degree. Top skills needed include: Java, SDLC, Agile Methodologies, and Web Services. 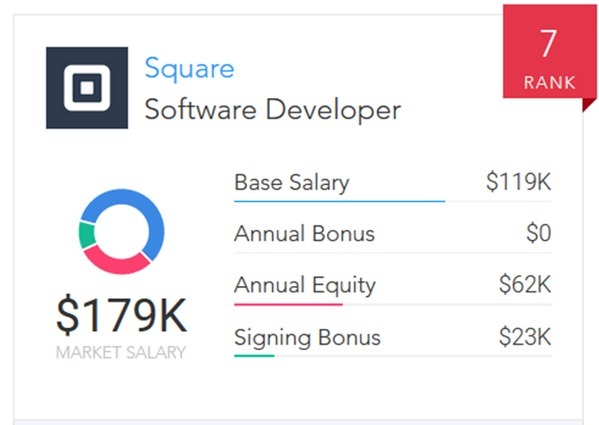 Square: The average base salary for Square systems engineers is $140K per year. The average market salary is $226K per year, which includes $140K base salary, $28.2K signing bonus and $58.3K annual equity. Square systems engineers are promoted, on average, at 2.4 years. 34 percent need a bachelor’s degree and 34 percent need a master’s degree. Top skills needed include: Ruby, DRBD, Sentry, and Systems Administration. 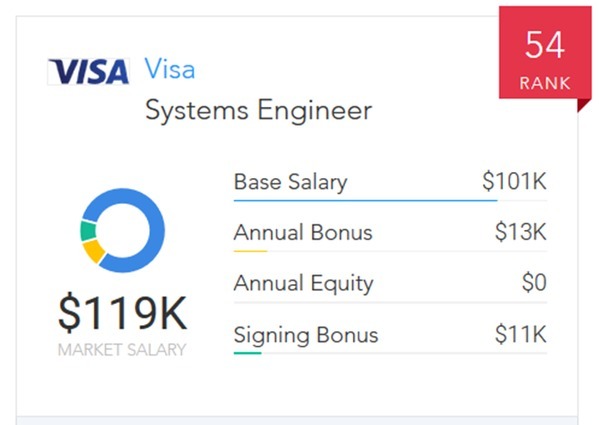 Visa: The average base salary for Visa systems engineers is $101K. The average market salary is $119K per year, which includes $101K base salary, $12.9K annual bonus and $10.8K signing bonus. Visa systems engineers are promoted, on average, at 4.7 years. 45 percent need a bachelor’s degree, and 13 percent need a master’s degree. Top skills include: SDLC, Integration, Agile Methodologies, Software Development, and Program Management. Square: The average base salary for Square data scientists is $140K per year. The average market salary is $209K per year, which includes $140K base salary, $22.4K signing bonus and $61.8K annual equity. Square data scientists are promoted, on average, at 22 months. 70 percent need a bachelor’s degree, 35 percent need a master’s degree, and 20 percent need a doctorate. Top skills needed include: Python, Machine Learning, Data Analysis, and Statistics. Visa: The average base salary for Visa data scientists is $102K per year. The average market salary is $117K per year, which includes $102K base salary, $12.2K annual bonus and $10.7K signing bonus. Visa data scientists are promoted, on average, at 3.6 years. 50 percent need a bachelor’s degree, 38 percent need a master’s degree, and 21 percent need a doctorate. Top skills needed include: Big Data, Data Analysis, Data Mining, SQL, and SAS. Square: The average base salary for Square product managers is $152K per year. The average market salary is $235K per year, which includes $152K base salary, $26.8K signing bonus and $60K annual equity. Square product managers are promoted, on average, at 20 months. 71 percent need a bachelor’s degree and 30 percent need a master’s degree. Top skills needed include: Product Management, User Experience, Analytics, Product Marketing, and Start-ups. Visa: The average base salary for Visa product managers is $113K per year. The average market salary is $144K per year, which includes $113K base salary, $17.4K annual bonus and $13.2K signing bonus. Visa product managers are promoted, on average, at 3.4 years. 58 percent need a bachelor’s degree and 27 percent need a master’s degree. Top skills needed include: Management, Product Management, Business Analysis, Vendor Management, and Credit Cards. Square: The average base salary for Square project managers is $134K per year. The average market salary is $213K per year, which includes $134K base salary, $24.2K signing bonus and $55.5K annual equity. Square project managers are promoted, on average, at 21 months. All need a bachelor’s degree, and top skills needed include: Product Management, Business Strategy, Project Management, LP, and Employee Training. Visa: The average base salary for Visa project managers is $101K per year. The average market salary is $129K per year, which includes $101K base salary, $14.6K annual bonus and $13K signing bonus. Visa project managers are promoted, on average, at 3.5 years. 48 percent need a bachelor’s degree and 34 percent need a master’s degree. Top skills needed include: Project Management, Program Management, PMP, SDLC, Vendor Management, and Business Analysis. Though Visa offers substantially less in compensation when compared to Square across all job titles mentioned here, it should be noted that Visa offers more than the average salary for companies overall for each of these positions with the exception of data scientists. Overall, data scientists have a market salary of approximately $135K annually, whereas Visa data scientist salaries stand currently at $117K annually. When comparing salary alone, Square comes out the clear winner over Visa. However, some might prefer work with Visa overall, considering its longevity in the field of finance and its truly global reach. Whichever criteria you value most highly, it pays to do your research when applying for a job in tech. The Paysa platform can help with that. Visit Paysa.com today to find personalized recommendations regarding skills, career paths, and salary negotiation tips and trends. Next ArticleWhat Does the Future of Self-Driving Cars Hold for Tech Talent?